I have to confess that I rarely like to make two separate meals for my family. I tend to stand by the idea that if I’ve taken the time to cook dinner, the least they can do is eat it, right? I decided to take pity on my older son, D, who is not a fan of seafood and make two versions of this baked spaghetti. While it wasn’t difficult to do, it was definitely made as a treat since D will be heading off to grad school soon and I won’t have the opportunity to cook for him for a bit. I began dinner by cooking spaghetti – I used most of a package of thin spaghetti, cooked as the package directed, but could have just as easily used linguini or some other pasta shape. Spaghetti just seemed “right” to me for this meal. Then I started with the protein side of things. I sauteed a package of chicken tenders in a large stock pot until they were nicely browned and thoroughly cooked. After removing the chicken, I added a pound of medium-sized raw shrimp without the shells and sauteed them in the same stock pot until they, too, were nicely browned and thoroughly cooked. After giving them each their own photo shoot, I popped them into separate casserole dishes and set about making the sauce. This sauce was a fairly simple one to do. I began by melting 2T butter in a saute’ pan and adding half an onion, finely diced. I let the heat take over and turn the onions translucent before adding some flour, and James River Cellars Chardonnay to start the creative juices flowing on this sauce. I added some skim milk, simply because I wanted the sauce to have a little more body than the leaner Chardonnay sauce, then added 1/2 c asiago cheese, and 1/4 c shredded cheddar cheese. Once the cheeses had melted into the sauce, I thinned it out with a little pasta water and some freshly ground pepper. Throughout the process, I would taste the sauce to make sure things were blending nicely – this is where you should add or alter your recipe when you can. Throwing salt on a finished product makes for a flatter taste in the meal, in my opinion. Once the sauce was complete, I topped the two casserole dishes each with half the cooked pasta, and half the cooked sauce, then stirred them both to combine all the ingredients. My final step was to bake the casseroles for 30 minutes in a 350 degree oven. I sprinkled a touch of cheese on the top, but that’s totally up to you. I just like the toasty cheese look when it comes out of the oven. As you can see by the photos above, incorporated into this collage, dinner looked similar but tasted different, depending on the meat that was included. M was happy with his Baked Shrimp Spaghetti and D was thrilled that his Baked Chicken Spaghetti had no seafood. It was a win-win over all…especially since I got to have a ramekin of each recipe! YUM! 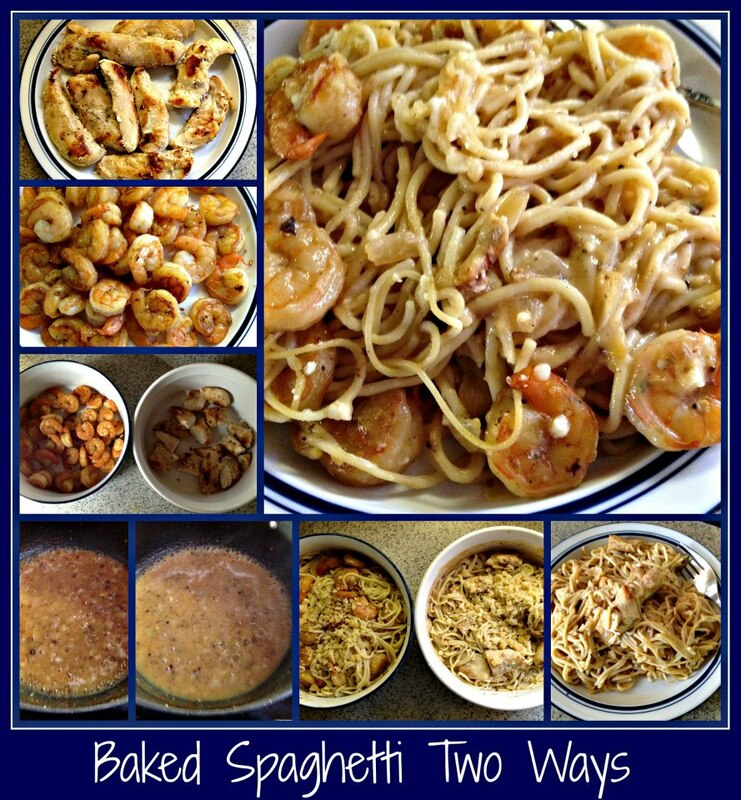 This entry was posted in Cooking, Wine and tagged baked spaghetti, cheese sauce, chicken, easy recipe, James River Cellars Chardonnay, pasta, shrimp, simple dinner, spaghetti.